Where does your poop go when you flush? In most large cities we use water, gravity, pumps, and a system of pipes to carry poo, household wastes, and precipitation away from cities and neighborhoods towards treatment plants. But not all sewers are created equally. A Separated Sewer System has two separate pipe networks. 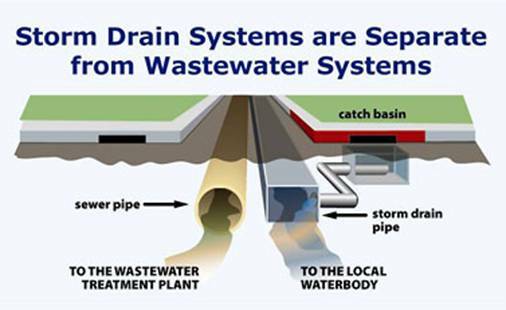 One set takes household and industrial waste to a treatment plant, and another set of storm drain pipes routes rain water and snow melt from streets directly into local waterbodies. Before the innovation of separated sewers, earlier cities (and still some smaller towns) were built with a Combined Sewer System. Combined Sewer Systems have one set of pipes that funnels everything toward the treatment plant, often leading to sewage overflows during wet weather (more on that here). Some cities, like Milwaukee below, currently have a combination of combined and separated sewer infrastructure. Do you know where your poo goes? If you live in a more rural area, you may use local systems such as a cesspit or septic tank (more on those here). If you live in a big city, chances are you flush to a centralized sewer system. But where? Try searching online for your city or town and the phrase “Sewage Treatment Plant,” “Wastewater Treatment Plant,” or “Water Resource Recovery Facility.” If you’re having trouble, search for a map of your local sewershed (the geographical area that connects to one plant) or for your local water board. GoogleMaps can help give you a good idea of where your poop is going. Zoom in on this map (or open it in a separate page) to you’re your nearest Sewage Treatment plant. ADVANCED! The United States EPA maintains a registry of all Wastewater Treatment Plants. Access the data here, and click here to see the data overlaid on a map. Note that the system is a little slow, and plants won’t appear until you’ve zoomed in a location in the US. In the lefthand sidebar, toggle the arrow next to “FRS Wastewater” to see a dropdown menu. There you can choose whether to see CSOs, and plants registered in different ways (some of which are businesses and factories doing private water treatment). Have you ever wondered what happens to water and other substances when they are flushed down our drains and toilets? It shouldn't be a mystery, and the City of Windsor and the Detroit River Canadian Cleanup initiative have partnered to create a wastewater video to help de-mystify the topic, and educate viewers.